Karen has been a volunteer at the Nursery for over six years. Her love for the Nursery and the kids we serve shines through each time she enters the building. When asked why she chose to volunteer at Crisis Nursery, Karen's response was; "During my teaching career, I planned a 7th grade field trip to the Nursery each year. I wanted my students to learn about this great place and the work done in and for our community. When I retired, I knew I had a great opportunity to share in the work, so I signed up." Marian started volunteering at Crisis Nursery in 2006, and since then has always gone above and beyond what is expected of a volunteer. As our longest standing volunteer, Marian has helped many new volunteers to learn our philosophy. She always maintains a positive attitude no matter what the circumstance. Marian is often at the Nursery multiple times a week, lending a hand when things get busy. She takes time to get to know the Nursery staff personally, even occasionally surprising us with chocolate! Marian's commitment and dedication to caring for the children is second to none. Thank you Marian! Check back often to hear about more of our 150 amazing volunteers! 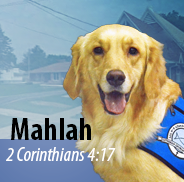 Mahlah is an LLC K-9 Comfort dog for Our Savior Lutheran Church in Milford, Illinois. LLC K-9 Comfort dogs are friends who bring a calming influence, allowing people to open up their hearts and receive help in time of need. Our friend Mahlah and her caretakers come to visit us at the Nursery every Tuesday. You can often find her receiving hugs and kisses from the kiddos. We love Mahlah and the comfort and joy she brings to the children and staff at the Nursery! 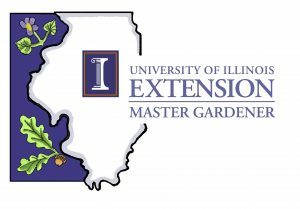 The Champaign County Master Gardeners are members of the University of Illinois Extension office serving Champaign, Ford, Iroquois, and Vermilion Counties. Their mission is- "Helping Others Learn to Grow" Sponsored by University of Illinois Extension, the Master Gardener program trains adult volunteers to help disseminate up-to-date, research-based horticulture information to home gardeners. They have been involved with the Nursery for many years. The Master Garners have worked tirelessly on our landscaping all around the Nursery as well as a sensory garden, and a vegetable garden for our children and staff. Thank you to the Champaign County Master Gardeners for your continued dedication to making the Nursery a beautiful place!